Hollywood and Los Angeles souvenirs at Rite-Aid on LaBrea at Santa Monica Blvd. For those of you traveling to Los Angeles and seeking souvenirs to take home, you don’t have to become customers of the touristy souvenir shops. 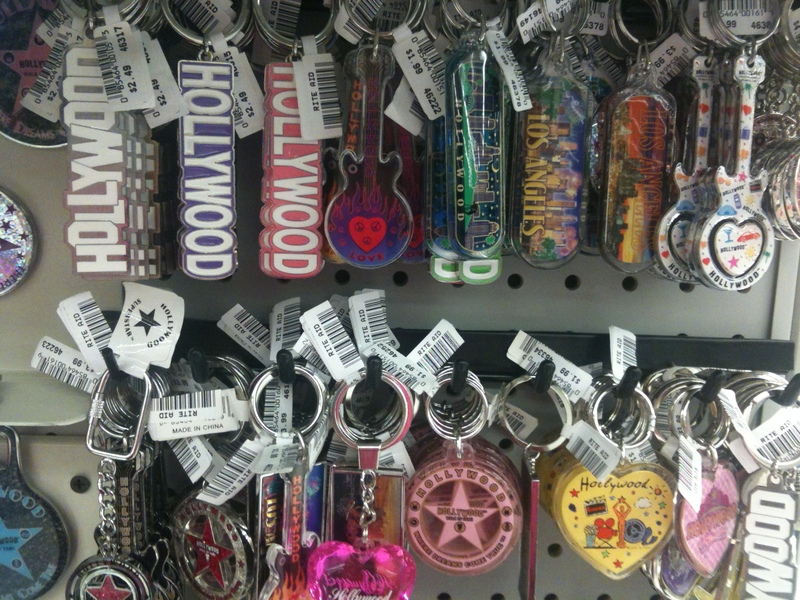 You’ll find a good assortment of keychains and other stuff at Rite-Aid pharmacy stores. These $2 and $2.49 Hollywood and Los Angeles keychains at Rite-Aid on LaBrea at the corner of Santa Monica Blvd. were on sale for “2 hours only” for “just $5” at a shop on Hollywood Blvd. the very same day. You’ll find Rite-Aid sells caps, bags, and a few other things as well. As an added note, I am a big fan of Rite-Aid’s corporate customer service. When I made an inquiry about an item, they went way beyond what was necessary. I always like the staff at this location.